I’m recovering… this is good because on Monday I wasn’t sure I’d make it to the end of the week. Why? Well, L and I have started our latest fat burning, self-flagellating exercise regime. 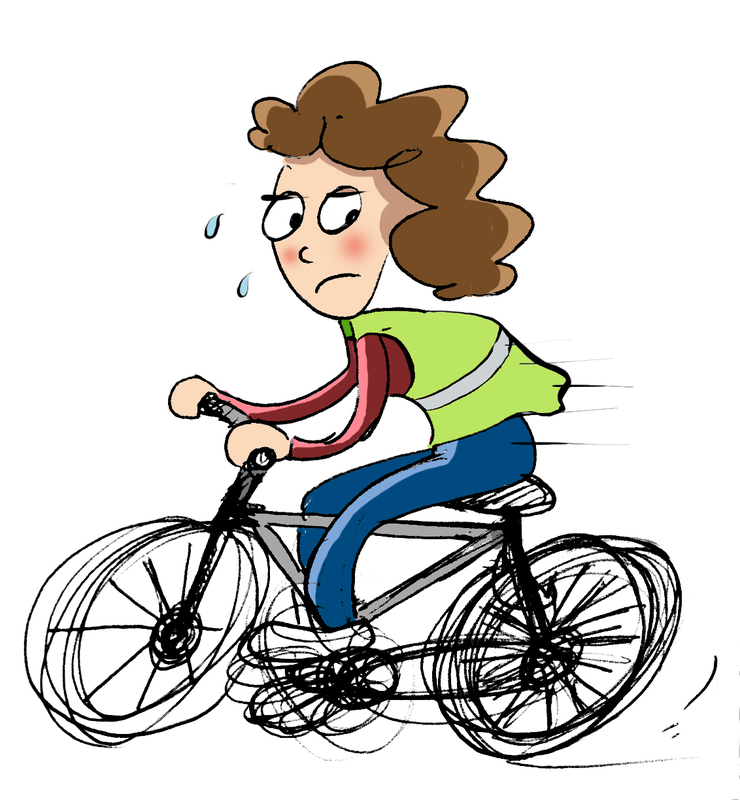 Last night I tried to explain the idea to a friend who was horrified to hear that I, a carefree, sofa-hugging student would voluntarily get up at 6:30 am three times a week to cycle to work with L – a 12mile round trip! We started two weeks ago and since then I have ridden 3 different bicycles in a desperate attempt to make the journey that little bit easier. Preparation for the regime required a week of psyching ourselves up and digging our bikes out of the shed. After dusting down the cobwebs, pumping up the tyres and reviving the rust-encrusted chains with a hefty dose of WD40, we were set to go. The first day proved interesting. Whilst I chose to ride a relatively new, full suspension mountain bike, L chose to ride a rusty old bike of mine that had been shoved from hallway, to cupboard, to shed (and seldom ridden) since my first days at University in 1996. We donned oversized florescent green jackets and attached every bicycle light we could find in the house until we shone and flickered like gaudy Christmas trees. Off we went! After a bit of crunching and grinding with the gear changes, my bike seemed to move fairly smoothly so I set off at a keen pace, eager to get the blood pumping! Five minutes down the road I turned to talk to L only to see a little flashing speck in the distance! “GET A MOVE ON” I shouted, “I have to make getting up at 6:30am worth the effort”. Stony faced and gasping for breath L finally caught up and grunted something about gears and the seat being too low. “Huh” I thought to myself “she’s probably just unfit and being grumpy about it” so I begrudgingly slowed down to pedal alongside her. 20minutes into the trip and L was really really grumpy (that’s not like her I hear you say) and I was chirpily trying to coax her along, offering to swap bikes as the grinding gears hers still hadn’t eased. “NO!” she stubbornly replied and plodded on at an excruciatingly slow pace. It took around 45 minutes to get to the hospital by which time the look on L’s face had turned to thunder. She obviously blamed me for the tortuous ride and the fact that she only had 15minutes to have a shower and get to the ward! Keeping calm, I offered some positive encouragement and persuaded her to swap bikes before I set off on the journey home. WELL MY GOD!!!!! It turned out that the bike was the biggest heap of scrap metal ever to be ridden and I suddenly felt guilty for thinking it was just that L was unfit! (we both are and this bike did nothing to help) Yes, the seat was too low but the pedal on one side was askew making pedalling extremely difficult. To make matters worse the gears were jammed on high, helping to simulate a mountain stretch of the Tour de France. By the time I got home my legs barely functioned and I had to crawl, red-faced, up the stairs to the bathroom. L’s thunderous mood from earlier was remarkably contagious. The second attempt: Both suffering from bruised private parts but with a positive outlook we set off. I was on the smooth ride with full suspension and changeable gears whilst L chose a Japanese ‘KIT’ bike put together by her father and rescued from the tip several days earlier! Well you can imagine… 10 minutes in and the complaints started to flow. I could see her brow break into deep furrows and the mood swing from mild enthusiasm into stubborn, why-the-hell-are-we-doing-this mode. A heated discussion ensued – “don’t be such a bloody martyr and swap the damn bike with me!” She did. Again, cold hearted, unsympathetic me, had presumed L was being ‘difficult’ but this bike seemed to have a mind of its own. The gears changed of their own accord and the seat managed to wobble loose flipping into a very uncomfortable, vertical position. With 5 minutes to go before reaching the hospital and after several failed attempts to hold the seat in its correct position, I conceded and turned back. I might as well have removed the seat all together and ridden on the pole because by this time the seat was so loose I slipped off the back with every adjustment. I rode most of the way back standing up before trying the seat sideways. It worked after a fashion but I now know why bicycle seats are designed the way they are…. trust me, forward is certainly the most ergonomic position. NB: I know these things can be fixed in a jiffy with the right tools and an understanding of simple bike maintenance. However we were not equipped and our understanding of bike maintenance matches our ability to carry out surgery on a rhinoceros. We cycled today (our 5th time) even though we’re still recovering from Wednesday’s wet and windy journey. The monsoonal weather helped L discover her waterproofs were not any kind of ‘proof’ at all. But even though she arrived home looking like a drowned rat, her mood was remarkably upbeat. She is now borrowing her father’s bike which has no problems apart from the rather large panniers that catch on her heels when she pedals. The weather today was bright and crisp filling us with the joys of spring… well, we were as joyful as one can be when hot, sweaty and out of breath on a 12 mile cycle. But I’m interested to know at what point one becomes a true cyclist? Is it when you start to snarl at pedestrians that walk in the cycle lane instead of the allocated pedestrian path? Or is it when one discovers a hidden cycle rage that is difficult to control when cars pull out in front of you or park across a cycle path? Perhaps it’s when one has mastered the art of cycling up to a pedestrian crossing, balancing precariously on the bike whilst simultaneously pressing the button, then crossing the road without putting a foot down? Whatever the case, we are getting on with it and even if some of our friends can run faster than we can cycle, I hope as our fitness improves we can shave at least 10 or 15 minutes off the journey time. 2) you go for a 60mile cycle for fun! I think my friends are at the extreme end of the cycling scale, tutting and shaking their heads when I told them I was riding a mountain bike, with suspension on a road!! “Well THAT will get you nowhere”. I defended my bike saying at least it worked and although it may not be light enough to pick up with one finger, it’s good enough for me! This entry was posted in Diets, General, Life, Uncategorized and tagged cycling, exercise, pedal by bighair63. Bookmark the permalink.